Discover a classic Big 5 safari in Kenya with unique touches. Enjoy luxury stays in some of Kenya’s best wildlife viewing regions, from the Amboseli to the Maasai Mara! This Luxury Kenya Vacation Packages: Classic Big 5 Safari was designed for 2 couples traveling together. One of the couples had traveled with us before on a South Africa safari, and the other couple was visiting Africa for the first time. This trip was the perfect mix of excitement, luxury, and authentic local experiences; the entire group was thrilled with their adventure! They stayed overnight at a fabulous hotel in Nairobi, then they started their Luxury Kenya Vacation Packages: Classic Big 5 Safari at ol Donyo Lodge. This unique lodge is set among the Chyulu Hills, or “Green Hills of Africa,” offering beautiful views of the landscape and Mt Kilimanjaro in the distance. They saw all of the Big 5 on their first few game drives, and they also had the chance to go on an incredible horseback safari among giraffes and zebras! Next on their Luxury Kenya Vacation Packages: Classic Big 5 Safari, they traveled to Lewa House in the north of Kenya. This is a truly special local gem, offering a friendly, familial atmosphere; jaw-dropping views of the wild surroundings; exceptional black rhino viewing in addition to the Big 5; and opportunities to explore on horseback, camelback, by helicopter, or in a yellow biplane! Our clients loved that their hosts made them feel instantly at home. Continuing their Luxury Kenya Vacation Packages: Classic Big 5 Safari, they traveled to the famous Maasai Mara to see the Great Migration of wildebeest. They spent 3 nights at Mara Plains Camp, an ultra-luxurious tented camp that was very different from what they had experienced so far. After seeing the wildlife in other parts of Kenya, they were thrilled to see the Great Migration and witness thousands of wildebeest thundering across the plains. Seeing a river crossing was a highlight of their trip! 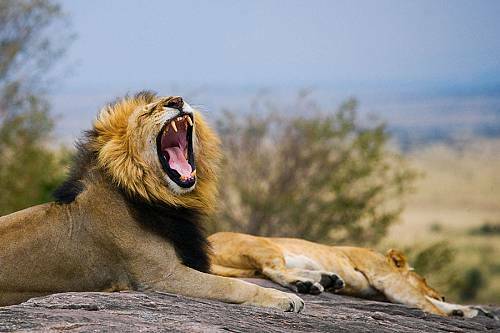 At last, their Luxury Kenya Vacation Packages: Classic Big 5 Safari came to an end. They enjoyed one last delicious breakfast at camp, then flew to Nairobi to catch their flight home. Today marks the beginning of an epic safari adventure! Fly to the Amboseli region of southeastern Kenya. You’ll have your first opportunity to see the Big 5 in the wild on a short game drive to ol Donyo Lodge. This luxurious lodge sits in thick woodland on a gently sloping hillside with views out over the plains to a distant Mt Kilimanjaro. Arrive in time for a scrumptious lunch followed by an evening game drive, and cap it off with scenic sundowners before dinner. Spend the next 2 days on safari at ol Donyo Lodge. The conservancy sits between Tsavo East and Amboseli National Parks, providing an important corridor for wildlife to travel freely—which means you’ll have the opportunity to see giant elephants, giraffes, lions, leopards, cheetahs, and much more on your game drives! You can also enjoy guided bushwalks and even a safari on horseback at no additional cost. Back at the lodge, enjoy creature comforts such as fine dining, massages, an infinity pool, private plunge pool in your suite, and luxurious lounges. It’s on to your next adventure! Fly to northern Kenya and Lewa House, your home for the next 3 nights. This unique, family-owned property offers a special opportunity to discover a side of Kenya that most visitors don’t get to see. The hosts live on property and will welcome you with open arms. 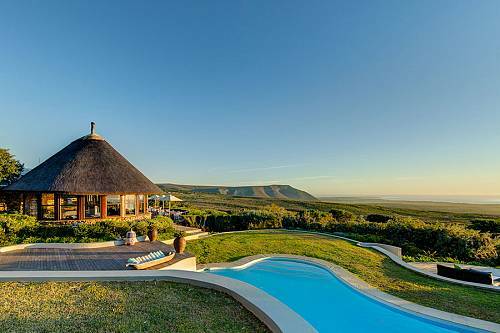 Lewa House is composed of just 9 cottages, which are spread out along the hillside so that each offers breathtaking views of the plains below. Beautiful shaded gardens surround the house and breakfast or lunch is often served on the lawn. Take a dip in the swimming pool overlooking a waterhole, which provides incredible game viewing without leaving the comfort of the house! Continue your safari adventures at Lewa House. The Lewa Conservancy is home to 10% of Kenya’s black rhino population, so it’s one of the best places in the world to see these rare endangered animals! In addition to Big 5 game drives, Lewa House offers some unique adventures including horseback or camel rides, helicopter excursions, and even a safari via bi-plane. We highly recommend adding a flight to your travel package so you can see Kenya from above. After breakfast, you’ll be transferred to your flight to Mara Plains, a luxurious safari camp in the famous Maasai Mara. The position of your tent provides you with the most incredible vista available in the Mara. This combined with the luxurious interiors, high-end attention to detail, and access to incredible facilities, makes this a must-stay property. After lunch, there will be time for an afternoon siesta and an evening game drive, followed by a drink as you watch the Mara’s spectacular sunset, rounding off another fabulous day on safari. Spend 2 days exploring this majestic park with its large diversity of beautiful scenery, including meandering rivers, towering escarpments, and rolling grasslands that provide the perfect habitat for an abundance of game. The Big 5 of Africa call this park home, including rare white and black rhinos. Game viewing is spectacular year-round; you may see a pride of lions stalking their prey, observe a herd of elephant and their fascinating social structure, or see pods of hippo wallowing in the rivers. The great wildebeest migration is one of nature’s wonders; an estimated 2 million animals migrate in a year-round pattern through Tanzania and Kenya, following the rain. Around July each year, the huge herds begin dramatic river crossings and the grasslands of the Mara are covered by a mass of moving wildebeest; crocodiles and other predators are never far away. Today, your adventures in Kenya come to an end. Fly to Nairobi, where you will catch your connecting flight back home.